Our ferry across the Chichester Channel deposited us like castaways on a narrow strip of shingle. There was nothing there. The ferry pulled out and journeyed back across the Channel, leaving us stranded. The narrow strip of shingle we were on ended in a sharp embankment, thronged with trees through which no path could be cut without a machete. This, of course, did not bother us. Our path is The Coastal Path. We were not heading inland; we had no need of machetes. Actually, perhaps we did: low branches overhung the shore, under which we had to duck, or over which we had to climb. This was not easy work. 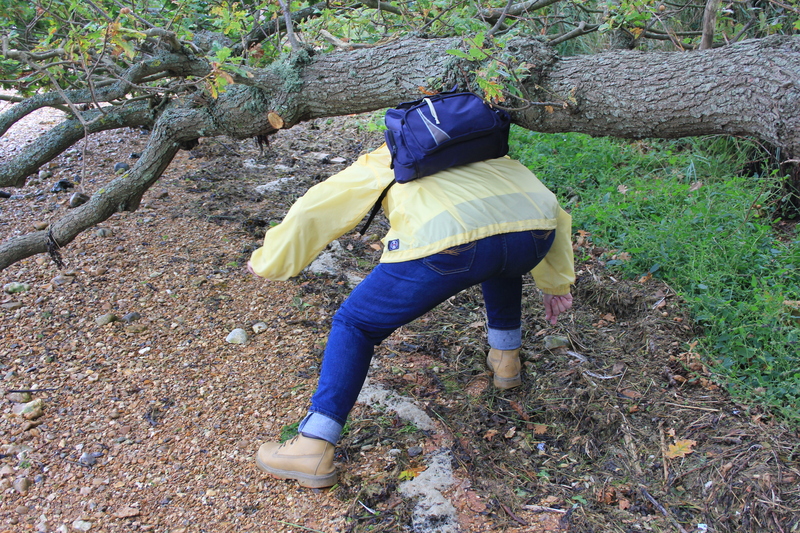 No, not that way Auntie Jenny – your backpack is in the way! Try a different angle of attack! Oh dear. Either Auntie Jenny needs a smaller backpack or the backpack needs a smaller Auntie Jenny…! 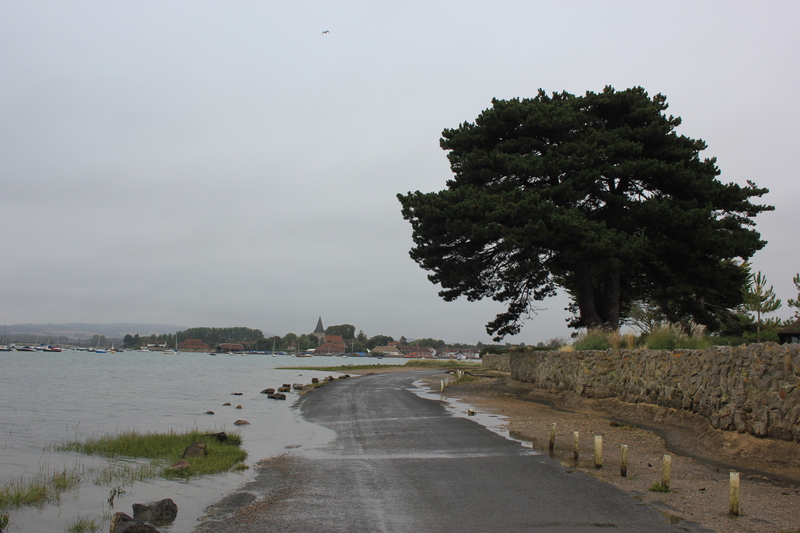 Eventually the shingle shoreline led us towards civilisation and became a tarmac road, although one that was clearly prone to flooding. We headed up towards the village of Bosham, which the Domesday Book of 1086 listed as one of the wealthiest manors of England. We had to walk around a blunted inlet of the Chichester Channel – a sort of watery cul-de-sac, to get there. As we walked along the water’s edge we passed a jetty. It had a sign up saying “Private Jetty”, though I’m not sure much attention was really being paid from some quarters. 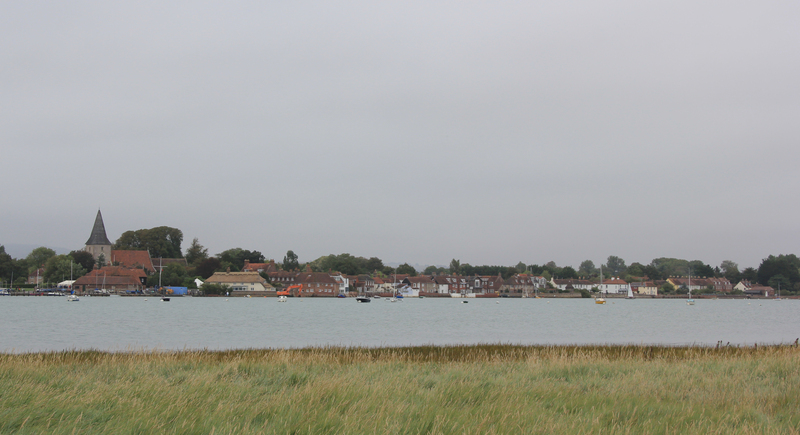 We circled round into Bosham. Shore Road which, as you may expect, runs along the shore, was flooded; it was high tide. 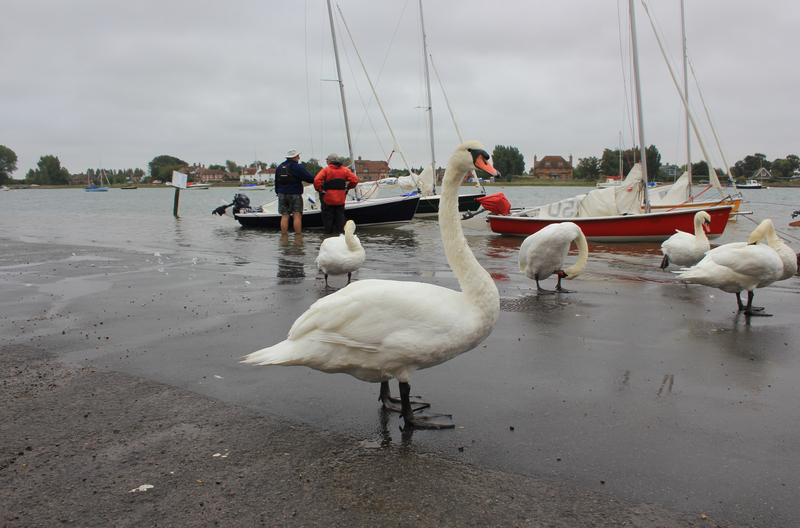 Some enormous swans stood impressively by an ice cream van, hoping for some scraps. Oh what handsome beasts, if only they could keep their beaks clean! 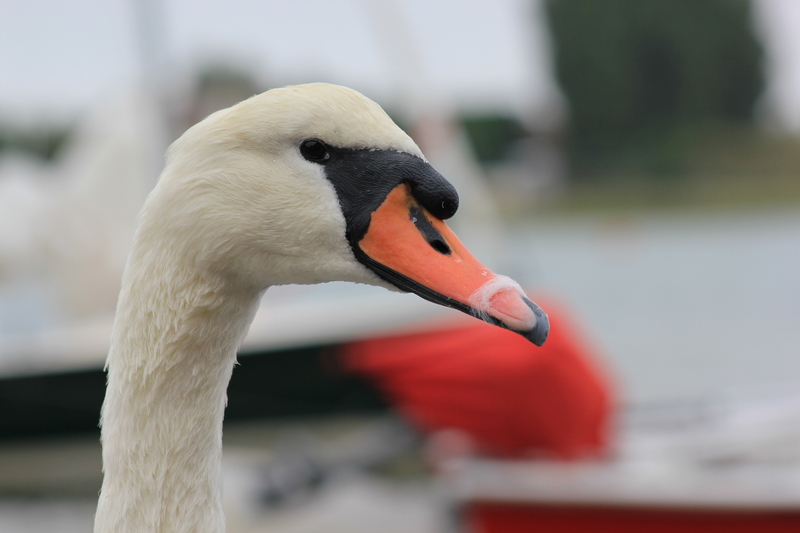 We did not succumb to the lure of ice cream, much to this swan’s disappointment, but continued a hundred yards or so up the road, reached the Anchor Bleu, and finished our day’s walk with a beer (so much better than an ice cream, I thought). 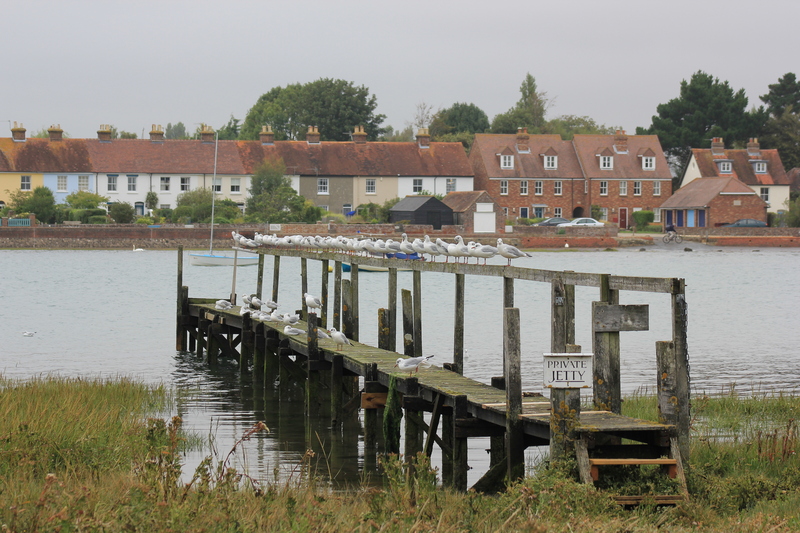 This entry was posted in West Sussex and tagged bosham, coast, jetty, swan, walking, west sussex. Bookmark the permalink. 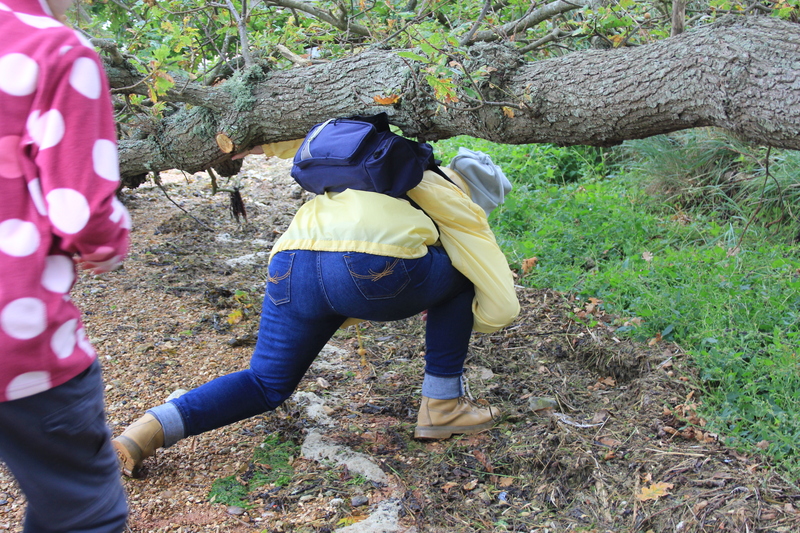 Nic – whats this with all the photos (somewhat unflattering) of my backside!!. I thought ‘Aged Aunts’ deserved a modicum of respect!!!!!. PS Now you definately owe me a Gin & Tonic!!! !